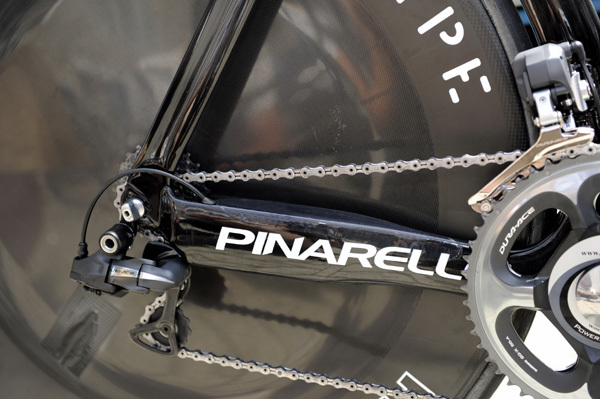 When Pinarello joined forces with Team Sky, the contract included a new time trial bike for Bradley Wiggins to arrive in time for the Giro, where this bike was debuted. The Graal has been built in a very short time but incorporates some interesting aerodynamic features. At the fork crown a small lip meets the head tube and continues the length of the top tube to channel air across the frame. 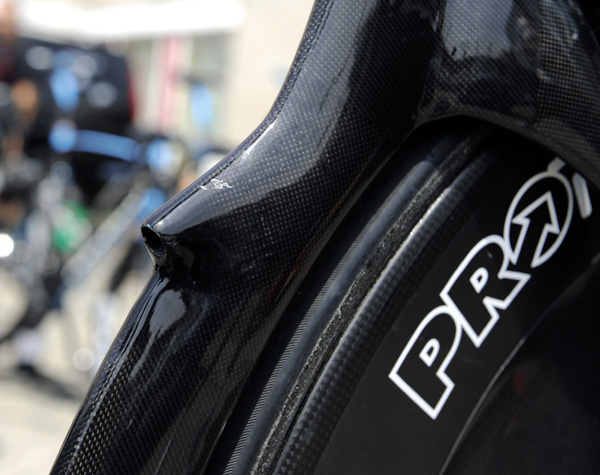 Small ridges along the down tube are to redirect a smooth airflow over the frame. The Graal’s design uses a vertical seatpost for improved aero dynamics and short chainstays house the battery for the Shimano Di2 in the deep driveside stay. We were a little stumped at first as to what the hole in the seat tube was for, but it is to tighten and adjust the rear brake, using a very long hex key. As the bike was designed so quickly, this ‘feature’ we’ve been assured is not likely to appear on production models. 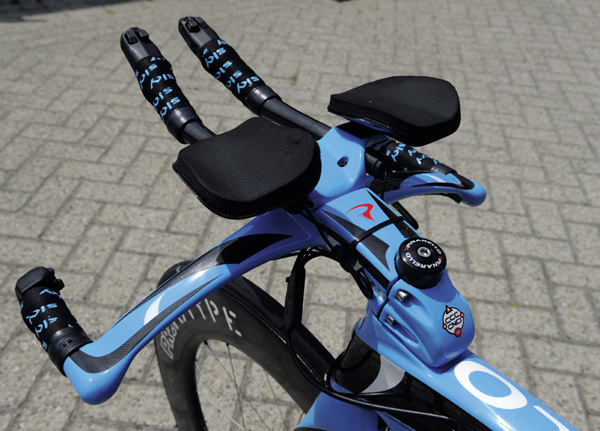 A new bar set-up uses a stem that tails off towards the top tube to help channel air that travels past the bars. The remainder of the bike uses Shimano Di2 throughout and notably Boasson Hagen’s shifters have the buttons facing skywards rather than inwards, due to his extensions being so close together. A ceramic Ultimate bottom bracket blends in nicely and gives low resistance. 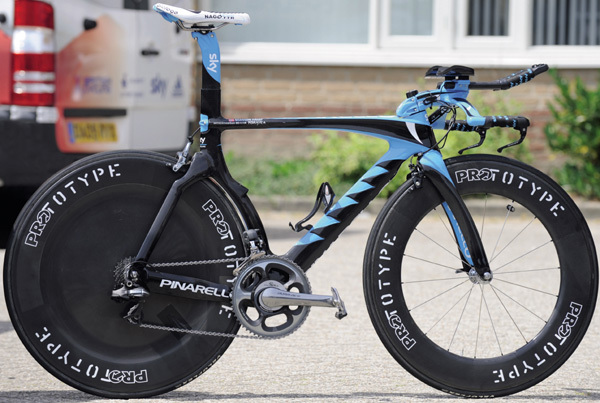 The Sky team ride HED wheels rebadged as Prototype but there’s no mistaking the HED Stinger disc and Stinger 9 front. Interestingly, the Graals also ridden by Christophe Moreau’s Caisse d’Epargne team don’t feature the aerodynamic ridges along the down tube signifying that Sky’s input into the frame design makes that particular feature exclusive to them. New bar set-up uses a stem that tails off towards the top tube to help channel air that travels past the bars. The Graal’s front TRP aero brake caliper is tucked away behind the fork, with just enough space for the cable. Hole in the seat tube is an access point via a long Allen key to tighten and adjust the rear brake caliper. 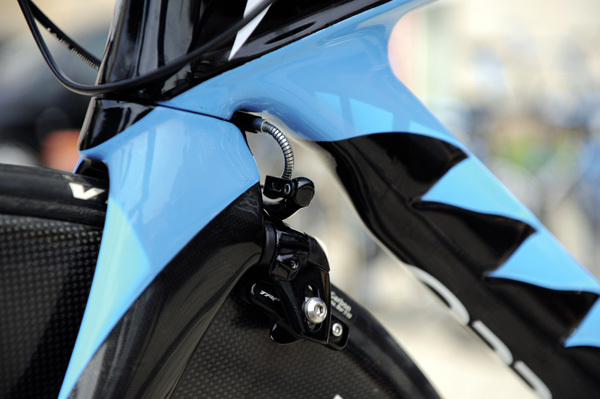 It is also possible to shift from the side bars with the electronic Shimano Di2 TT components. 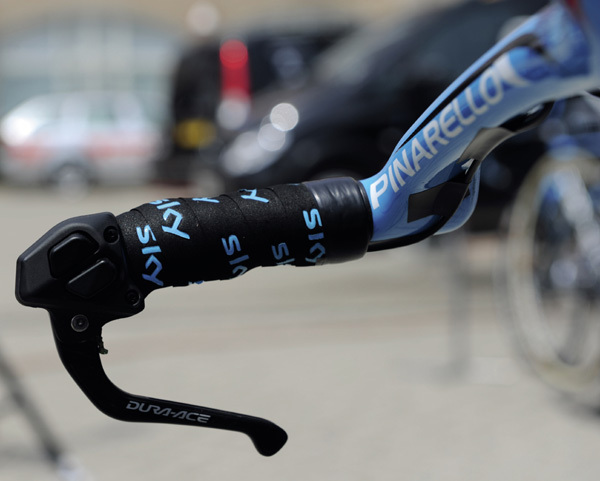 The Shimano Di2 battery pack is housed in the super deep driveside chainstay. 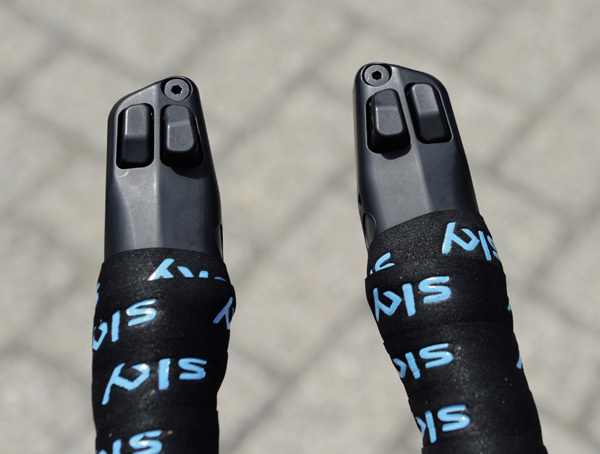 Boasson Hagen’s Di2 shifters are on the tops of the extensions rather than the insides for easier thumb shifting.